EDIT: Giveaway is officially over. Congratulations to Stephanie La Plante for submitting the randomly-chosen 892nd entry. Although computers are handy, there's still certain tasks when a pen and paper beats technology's fancy features. For example, when taking notes, I'm more likely to remember the information later if I hand write instead of type the words. Here's a fact you're not likely to forget either way: Vishruti of Indian Journals is giving away a medium-sized journal from her handmade Etsy shop. 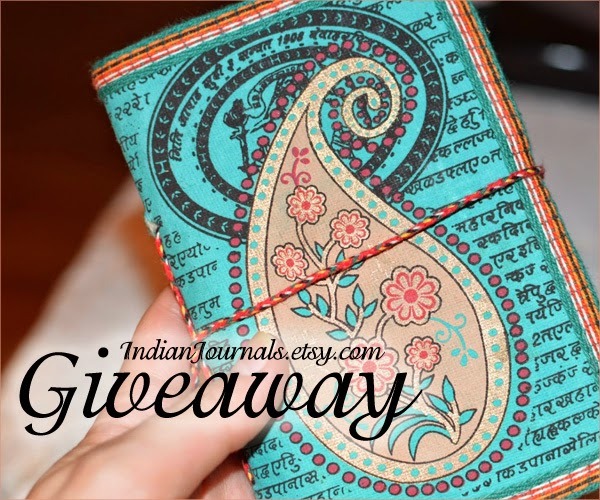 The winner may choose one 6x4" art journal or Sari fabric journal. Vishruti offers the journals in four different sizes, but medium is the most popular. Not only is the everyday journal easy to carry in a backpack or purse, but its pages allow plenty of space to use as a food tracker, travel log or personal diary. I might have enjoyed grade school more if I could have written in the paisley art notebook above instead of a boring black and white composition book. Upcycled patchwork fabrics, brocade remnants, embellished Saris and traditional Indian folk art prints are used to cover her OOAK journals. The book twine is wrapped in a style reminiscent of vintage journals from India. Recycled acid free handmade paper is bound using sturdy stitching techniques that ensure quality craftsmanship. Based on the passion of her products, it's no surprise that Renew, Reuse and Recycle has always been her Mantra. Use the Rafflecopter below to enter to win worldwide giveaway before 11:59pm EST on August 20, 2014. Be sure to leave the mandatory comment on the blog post with the same name you use to fill out the Rafflecopter - all entries by winner must be easily verified or a new winner will be chosen. Not including usernames when asked will also get you disqualified. I love the Indian Elephant journal. Om Chakra Sea Blue Green is my top favorite, I think. They are all so beautiful. Thank you for the chance to win one. Beautiful work! I love so many but the XL Book, Sari Art Journal, Junk Journal, Diary, Blank Writeable Book, Fabric Cover, Gift For Her, Eco Friendly Gift, Recycled Handmade Paper is my favorite. I;d pick the Dancing Peacock Indian Art Journal in White. Such a lot of pretty fabrics and bold colors. I love elephants, so I couldn't go past the Indian Elephant journal. I'm glad I chose the pink elephant one to do my review on...it's perfect! Hello! I really like these journals! My favorite is her Paisley Indian Art Journal Sea Blue Green. Awesome. Thank-you for the fun chance! I love Indian Sari Journals, Set of 8. I really like the Paisley Art, Indian Journal, Sea Blue Green, Ancient Indian Language. The colour is so vibrant, I love it! this is my favorite item. I like the Paisley Art, Indian Journal, Sea Blue Green. Dancing Peacocks, Indian Art Journal in Bright Green is my favorite. OOOooo! I love the mint green Om chakra art journal! I love the Indian Elephant Art Journal. Blank Art Journals, Set of 4, Indian Sari Journals, 4 sizes, Choose any design, Bulk Buy, Artist Pack, Family Pack, Stocking Stuffers, Gifts is my favorite. I like this one https://www.etsy.com/listing/179969681/handmade-journal-blue-bronze-financial?ref=shop_home_active_8. It's a pretty blue color. I love the Indian paisley designs! I love the Dancing Peacock notebook. It's so pretty. The blue green paisley is my favorite, but I also like the pink elephant. The dancing peacock journal in white is my fave. My rafflecopter name is Ashley Nicks. Thanx! My rafflecopter name is yoey davis; I forgot to mention that on my previous comment. My favorite item is the Large Journal, OM Chakra OHM Art , Orange, 8 x 6 inches, Spiritual Diary, Prayer Affirmations Journal, Hindu Sanskrit Design, Big Notebook. I like the cover because it come from the Om who is a mantra and mystical Sanskrit sound of Hindu origin. I also like that journal is pages are made from made from Recycled Acid Free Handmade Paper. I really like the pink elephant food journal. I love the art journal with dancing peacok! I just totally LOVE the hobo bag. lately i have a thing about Elephants. :D I love the Elephant Art Journal. All journals are beautiful!! but especially paisley art in sea blue green, are so pretty! Greetings from Argentina! Lovely! My favorite is a tie between the sea blue green paisley one and the peacock one! I also HAVE to make HANDWRITTEN notes if I want to remember something. Typing just doesn't do it for me! My favorite is the indian elephant art food journal! All of them are so pretty, it was hard to choose! I really like the dancing peacock!! All are so pretty but I love the paisley art in sea blue green. My favorite is :Handmade Journal, Green Gold, Financial Diary, Tax Journal, Expenses Record, Banking Book, Statements Log, Business Journal, Blank Paper. I love the green sari fabric journal! I love the Indian Elephant journal! I love the Large Indian Paisley Art Journal. I really love the Sea Blue Green Paisley Journal. I just love the paisley journal and all the colors it comes in. I like the Maroon Gold, OM Journal Indian, Brick Red best. Sling Bag, Hobo Bag is my favourite item from the shop. I have to comment here with my google account which is different than my rafflecopter account. My rafflecopter user name is Andrea Amy and the email is andrea_hockeygirl at hotmail dot com. There are so many nice ones to choose from. I really like Big Indian Sari Journal,Pink Red Sequins for my daughter. I like the Dancing Peacock Indian Art Journal! I like the Sea Blue green paisley art! My favorite are the sari journals, any one of them! I love the dancing peacock journal, they all look fantastic! Paisley art Indian journal is my choice its made with beautiful color and detail! i love the Dancing Peacock Indian Art Journal !! The Dancing Peacock is nice. I like the Indian Paisley,Indian Miniature Painting, Art Journal, Mint Green, Floral Paisley Design, Recycled Paper, Handmade Paper, Boteh Buta Design. I am in love with their sling bags. I love the bright pink color and design. I like the Set of 8 Indian Sari Journals. They are lovely! awesome giveaway...love the beautiful elephant journal,,thanks. My absolute favorite is the Sling Bag, Hobo Bag, Everyday Use, Patchwork Embroidery Sari,OOAK Pink Party Bag,Embroidered Bag, Stylish Tote Bag, Gift for her, Girls Gift. My favorite is the dancing peacock journal. The colors are beautiful. My favorite is the Sari Journal Diary, Blue Orange Yellow. I love the Indian Elephant Art Food Journal, Pink, Handmade Recycled Paper Eco Friendly Diary Blank Notebook, 6x4 inches, Tradional Good Luck Elephant!